Showing items in category Antigua, sorted by newest listed first. ANTIGUA - 1920 3d + 1/2d 'War Stamp' on registered OHMS cover to USA used at ST.JOHNS. 1920 (MR.15.) registered O.H.M.S. 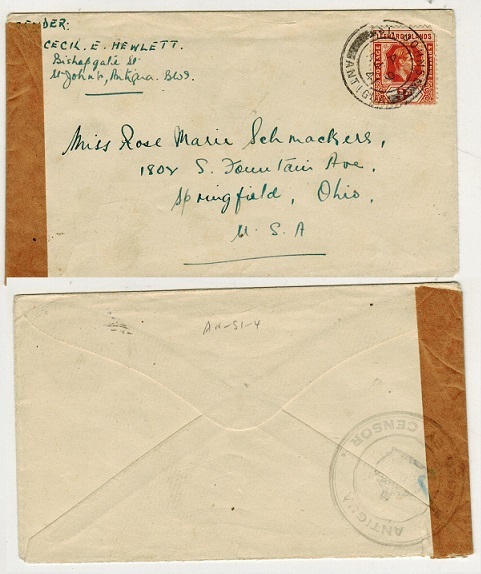 cover addressed to USA bearing 3d (SG47-scarce) tied alongside 1/2d 'War Stamp' (SG 53-in red) tied by ST.JOHNS/ANTIGUA cds's. ANTIGUA - 1918 'War Stamp' cover to USA used at ST.JOHNS/ANTIGUA. 1918 (JA.24.) 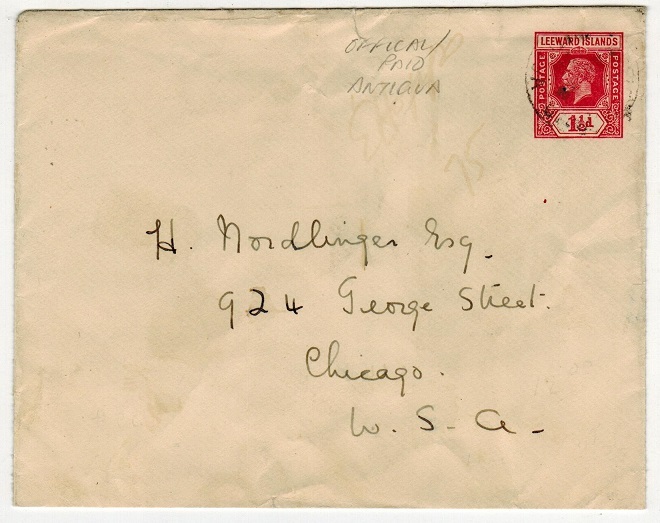 cover addressed to USA bearing 1/2d 'War Stamp' (SG 52-in black) and 1/2d 'War Stamp' (SG 53-in red) tied by ST.JOHNS/ANTIGUA cds's. ANTIGUA - 1937 'HMS DRAGON' illustrated maritime cover to USA. 1937 (MY.12.) 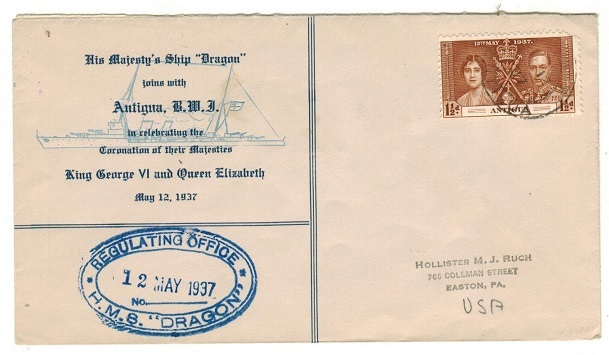 use of illustrated 'HMS DRAGON' cover addressed to USA bearing 1 1/2d 'Coronation' adhesive with blue oval REGULATING OFFICE/HMS DRAGON h/s at left. ANTIGUA - 1886 1d outward section of 1d+1d carmine PSRC uprated to UK. H&G 4. 1886-87 1d outward section of the 1d+1d carmine on cream postal stationery reply type postcard addressed to UK with 1/2d green added and cancelled by ANTIGUA cds dated SP.10.90. The reverse shows a drawing of a 'cat and mouse' in black ink. (Contemporay). Small corner bend at top right otherwise a most elusive piece of stationery to locate and nicely uprated. H&G 4. ANTIGUA - 1903 1d rate postcard to UK used at ALL SAINTS. 1903 (DE.2.) use of a picture postcard addressed to UK depicting 'English Harbour, Naval Dockyard and Lord Nelson Wharf' bearing 1d adhesive tied by scarce ALL-SAINTS/ANTIGUA cds with a further strike below. (Proud type D1). 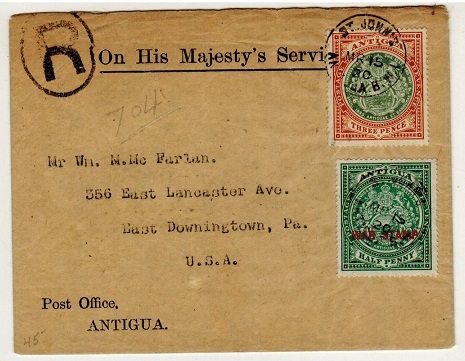 ANTIGUA - 1924 3d ultramarine RPSE uprated to USA. H&G 3. 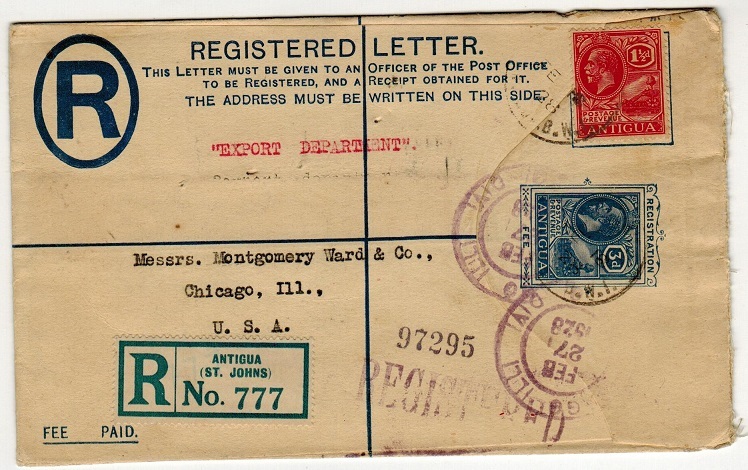 1924 3d ultramarine on cream registered postal stationery envelope (size G) addressed to USA and marked 'Export Department' bearing additional 1 1/2d adhesive and tied by light St.JOHN'S/ ANTUGUA cds's dated FE.13.28. H&G 3. ANTIGUA - 1952 OHMS postcard addressed to USA used at ST.JOHN'S. 1952 (APR.15.) stampless black on blue-green O.H.M.S. 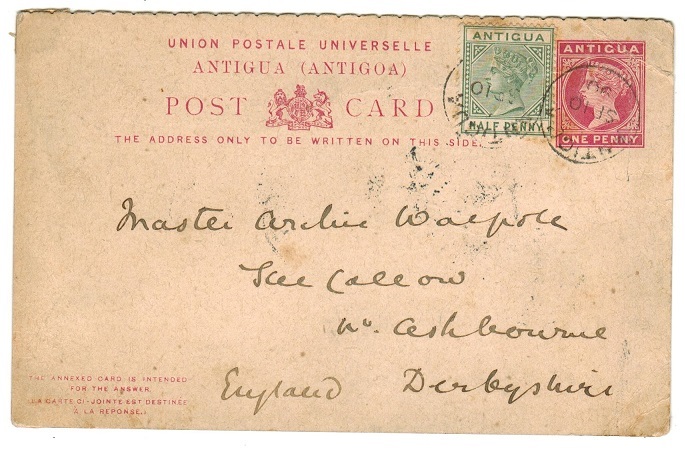 postcard addressed to USA with pre-printed reverse regarding postage stamps from the General Post Office on Antigua cancelled by ST.JOHNS/ANTIGUA cds and with oval GENERAL POST OFFICE/ANTIGUA h/s at lower left. ANTIGUA - 1929 use of Leeward Island 1 1/2d brown RPSE to USA used at ST.JOHNS. H&G 8. 1928 1 1/2d brown postal stationery envelope of Leward Islands (H&G 8) addressed to USA and cancelled by ST.JOHNS/ANTIGUA cds dated JU.22.29. 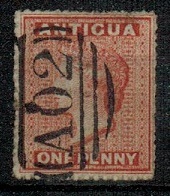 ANTIGUA - 1930 use of Leeward Islands 1 1/2d brown PSE to UK used at ST.JOHNS. H&G 8. 1930 (MR.4.) use of Leeward Islands 1 1/2d brown on cream postal stationery envelope (H&G 8) addressed to UK and cancelled by ST.JOHNS/ANTIGUA cds. ANTIGUA - 1925 2d rate cover to USA used at ST.PETERS. 1925 (FE.19.) 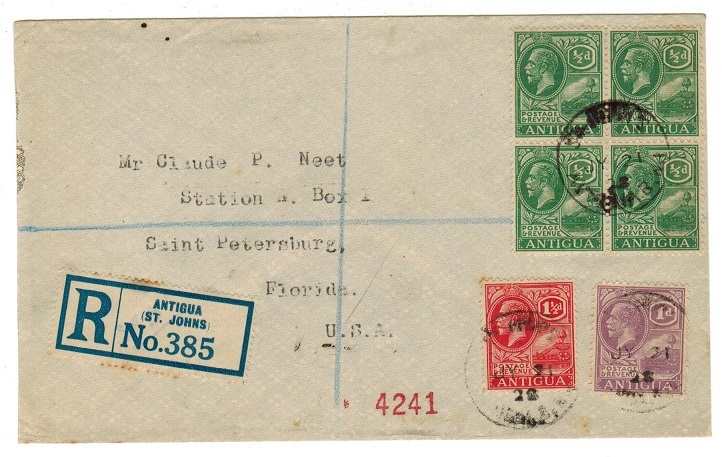 cover addressed to USA bearing 2d adhesive tied by ST.PETERS/ANTIGUA cds. ANTIGUA - 1975 (circa) dark blue 'FORMULA' (size G) RPSE unused. 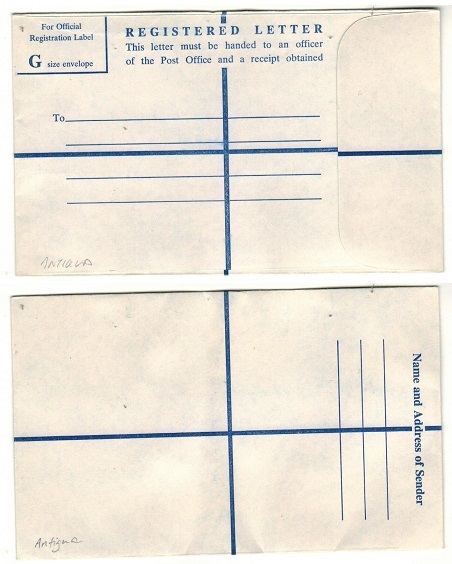 1975 (circa) dark blue on white FORMULA registered postal stationery envelope (size G) in fine unused condition. ANTIGUA - 1932 'OHMS' cover to USA with 5d adhesive used at ST.JOHN'S/ANTIGUA. 1932 (DE.4.) 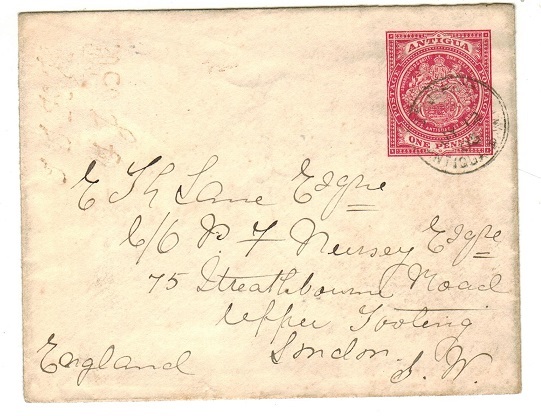 registered OHMS cover addressed to USA bearing Leeward Islands 5d 'key plate' adhesive (SG 71) tied ST.JOHNS/ANTIGUA. ANTIGUA - 1862 6d 'Perkins Bacon' PLATE PROOF in black. 1862 6d (SG type 1) 'Perkins Bacon' PLATE PROOF printed in black on toned woved paper. ANTIGUA - 1862 6d 'Perkins Bacon' PLATE PROOF with defaced head. 1862 6d (SG type 1) 'Perkins Bacon' PLATE PROOF printed in black on thick card with DEFACED HEAD by white cross. 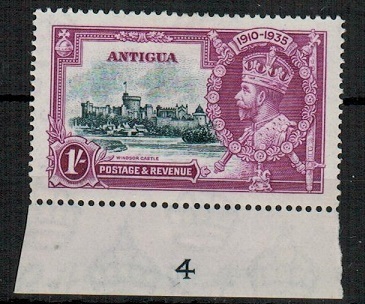 ANTIGUA - 1924 3d ultramarine RPSE unused. H&G 3. 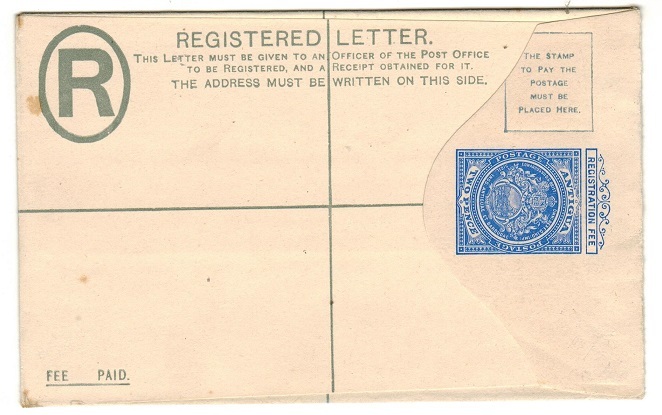 1924 3d ultramarine on cream registered postal stationery envelope (size G) in fine unused condition. H&G 3. ANTIGUA - 1926 1 1/2d PSE of Leeward Islands to USA cancelled OFFICIAL PAID/ANTIGUA. H&G 6. 1926 1 1/2d red on cream postal stationery envelope of the Leeward Islands (H&G 6) addressed to USA & cancelled by rather light OFFICIAL PAID/ANTIGUA cds dated AU.18.28. A rare use of this envelope. ANTIGUA - 1941 2d rate censored use of postcard to USA. ANTIGUA - 1941 1d rate censored use of postcard to USA. 1941 use of Trinidad picture postcard addressed to USA bearing 'GV' 1d adhesive tied by ST.JOHNS/ ANTIGUA cds with crowned ANTIGUA/PASSED BY CENSOR h/s at left. 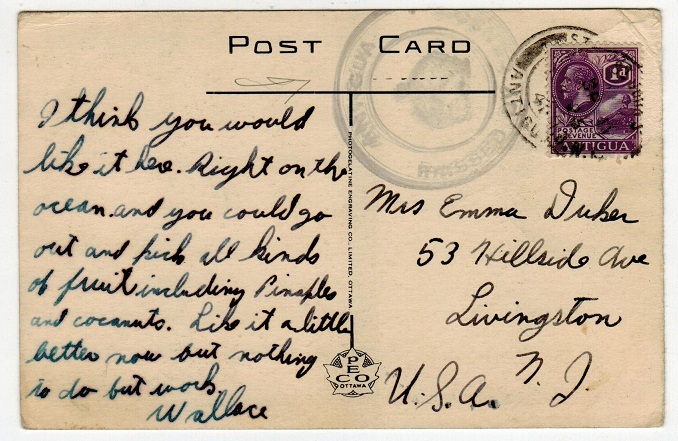 A very scarce censored use of a postcard. ANTIGUA - 1870 2/-, 3/-, 4/- and 5/- 'STAMP DUTY' adhesives mint. 1870 2/-, 3/-, 4/- and 5/- blue and dark blue STAMP DUTY adhesives with 'Crown CC' watermarks. Difficult high values in mint condition. Barefoot and Hall 7-10. 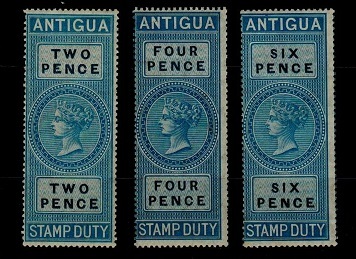 ANTIGUA - 1870 2d, 4d and 6d 'STAMP DUTY' adhesives mint. 1870 2d, 4d and 6d blue and dark blue STAMP DUTY adhesives with 'Crown CC' watermarks in mint condition. Barefoot and Hall 2,4 and 5. 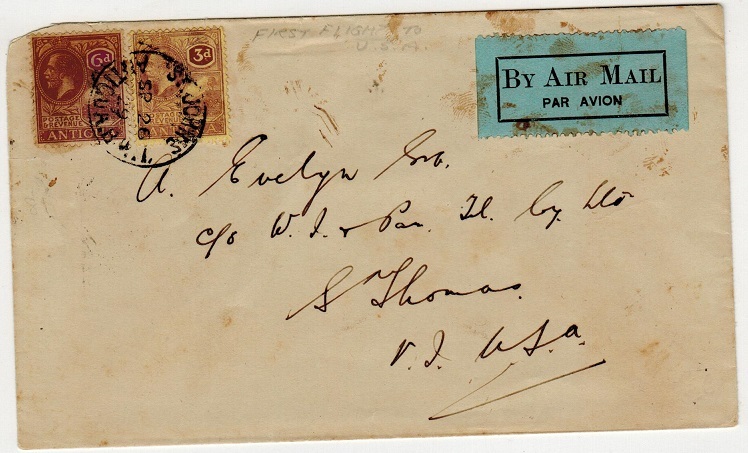 ANTIGUA - 1891 1/2d green postal stationery wrapper to UK. H&G 1. 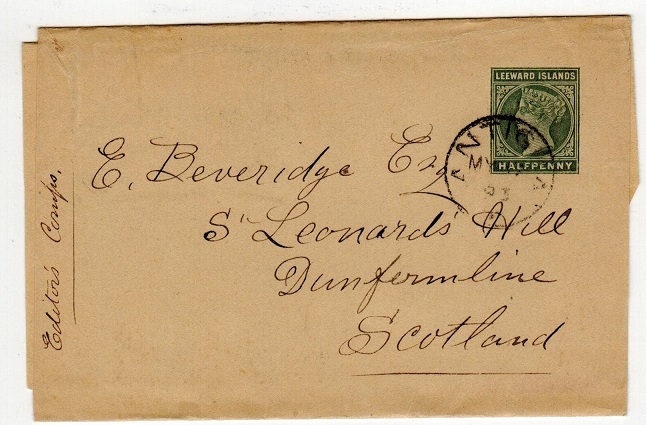 1891 1/2d green on cream postal stationery wrapper of Leeward Islands (H&G 1) addressed to Scotland and cancelled by ANTIGUA cds dated MY.17.93. 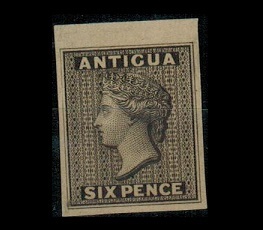 ANTIGUA - 1898 1/2d 'Printed Paper' rate wrapper to UK. 1898 (DE.7.) use of paper newspaper wrapper addressed to UK handstamped 'The General Agency/ Antigua' and bearing Leeward Islands 1/2d adhesive tied by s/r ANTIGUA cds. A nice 'Printed Paper' use. ANTIGUA - 1967 MISSENT TO ANTIGUA postcard. 1967 (MY.11.) 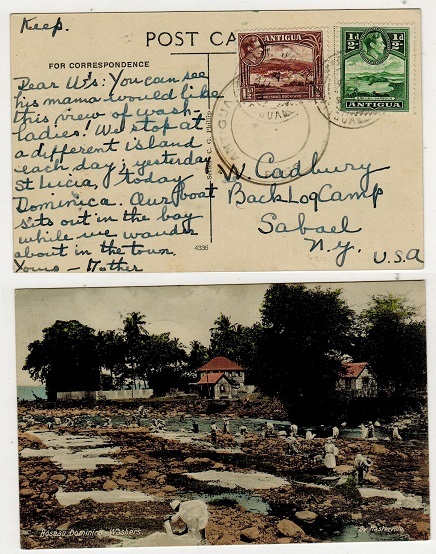 postcard from St.Lucia to Montserrat but sent in error to Antigua and struck by black MISSENT TO ANTIGUA handstamp. ANTIGUA - 1959 MISSENT TO ANTIGUA cover. 1959 (DE.14.) 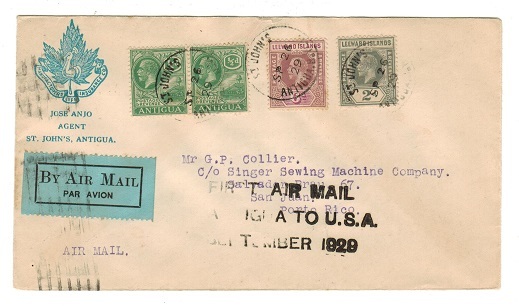 cover addressed to USA from Trinidad but sent in error to Antigua with black straight lined MISSENT TO ANTIGUA handstamp applied on front. ANTIGUA - 1933 5d rate cover to USA used at ST.JOHN'S. 1933 (DE.28.) 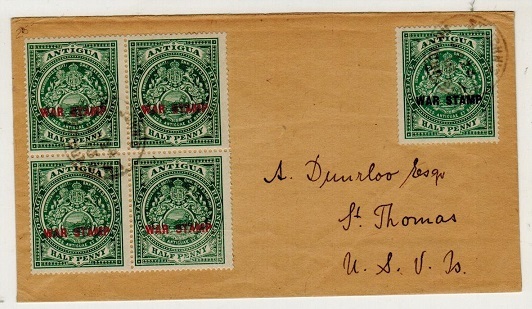 cover addressed to USA bearing Leeward Islands 5d dull purple and olive green (SG 71) tied ST.JOHNS/ANTIGUA. ANTIGUA - 1929 first flight cover to Trinidad. 1929 (SP.22.) first flight 'AIR MAIL' illustrated cover addressed to Trinidad bearing Leeward Islands 3d and 6d adhesives tied ST.JOHNS/ANTIGUA. Only 207 covers were flown. ANTIGUA - 1876 1d lake cancelled 'ANTIGUA/ENGLISH HARBOUR'. SG 16. 1876 1d lake (perf 14) issue with 'Crown CC' watermark cancelled by rare ANTIGUA/ENGLISH HARBOUR cds dated 1.OC.80. Proud type D2. SG 16. ANTIGUA - 1943 2d rate censored postcard use to USA. 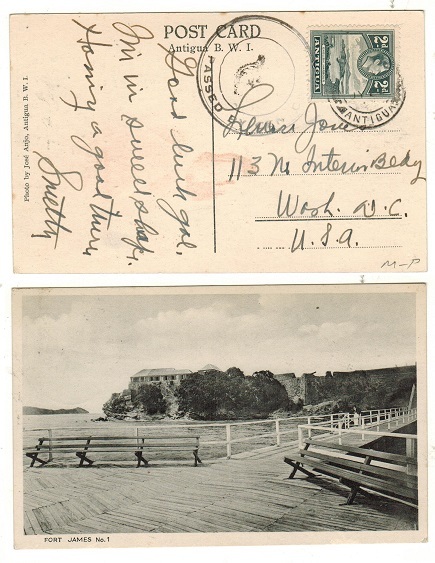 1943 (circa) use of picture postcard addressed to USA depicting 'Fort James No.1.' bearing 2d grey adhesive tied by part ST.JOHN'S/ANTIGUA cds with black circular PASSED BY CENSOR crown handstamp at left. ANTIGUA - 1945 1/1d rate 'Opened By Examiner' censor cover to USA. 1945 (JA.17.) cover addressed to USA bearing Leeward Islands 1d and 1/- adhesives tied by ST.JOHNS/ANTIGUA cds with black on white P.C.90/OPENED BY EXAMINER/ IB/112 censor label. Miller type L8. Unrecorded with this number. ANTIGUA - 1942 1/4 1/2d rate registered 'Examined by Censor' cover to USA. 1942 commercial cover registered to USA (rough opening at top) bearing 1 1/2d, 2d and 1/- adhesives tied in combination with Leeward islands 1d (making up a 1s 4 1/2d rate) tied by smudged ST.JOHNS/ANTIGUA cds's and with manilla censor strip at right tied on the reverse side by EXAMINED BY CENSOR h/s (Miller type S2-Antigua exicised) and with 'B/2' inserted in blue manuscript. ANTIGUA - 1941 1/1 1/2d rate 'Examined by Censor' cover to USA. 1941 cover addressed to USA bearing Leeward Islands 1 1/2d and 1/- adhesive tied by ST.JOHNS/ ANTIGUA cds with manila censor strip at left tied on the reverse side by EXAMINED BY CENSOR/ ANTIGUA handstamp with '2' inserted below in blue manuscript. Miller type S2(1). ANTIGUA - 1941 2d rate 'Passed by Censor' cover to Canada. 1941 (AU.1.) 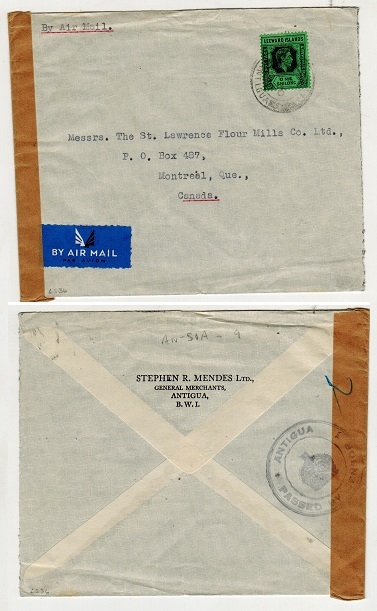 cover addressed to Canada bearing Leeward Island 2d adhesive tied by light ST.JOHNS/ ANTIGUA cds with manila censor strip at left tied on the reverse by crowned circular ANTIGUA/ PASSED BY CENSOR h/s with '2' applied on tape in manusctip alongside. Miller type S1. ANTIGUA - 1910 1/2d rate postcard use to UK used at ST.JOHNS. 1910 (NO.26.) 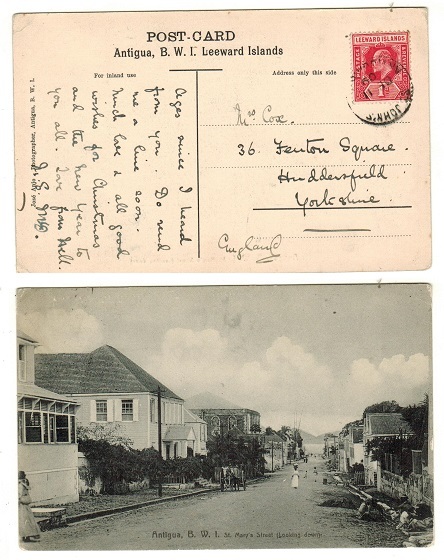 use of picture postcard addressed to UK depicting 'Redcliff Street-St.Johns, Antigua' bearing Leeward Islands 1/2d adhesive tied ST.JOHNS /ANTIGUA. ANTIGUA - 1909 1d rate postcard to UK used at ST.JOHNS. 1909 (DE.11.) 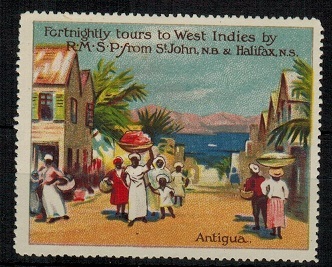 postcard use to UK depicting 'St Marys Street/Antigua' bearing Leeward Islands 1d adhesive tied ST.JOHNS/ANTIGUA. 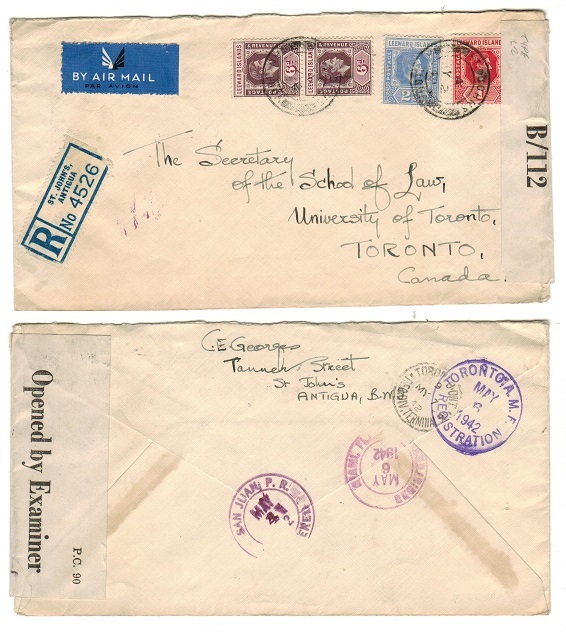 ANTIGUA - 1951 'University' pair on registered cover to UK used at PARHAM. 1951 (MY.17) reg'd cover to UK bearing Leeward Islands 'University' pair (SG 118-9) tied by PARHAM/ANTIGUA cds with R/PARHAM/ANTIGUA/No.reg'd rubber h/s at lower right. 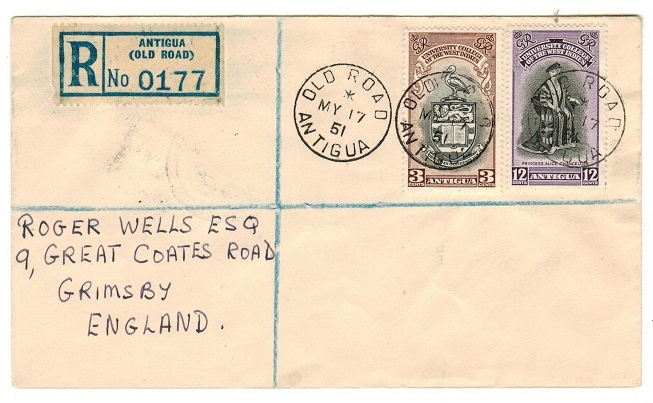 ANTIGUA - 1951 'University' pair on registered cover to UK used at OLD ROAD. 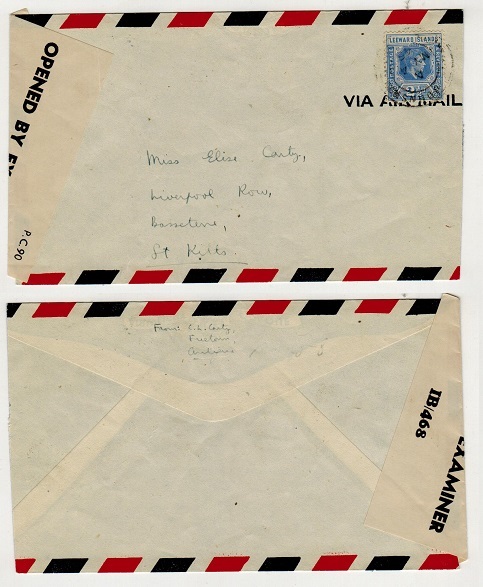 1951 (MY.17) reg'd cover to UK bearing Leeward Islands 'University' pair (SG 118-9) tied by OLD ROAD/ANTIGUA cds with blue on white R/ANTIGUA/(OLD ROAD)/No. label at left. ANTIGUA - 1951 'University' pair on registered cover to UK used at GRAY FARM. 1951 (MY.17) reg'd cover to UK with 'University' pair tied GRAYS FARM/ANTIGUA cds. 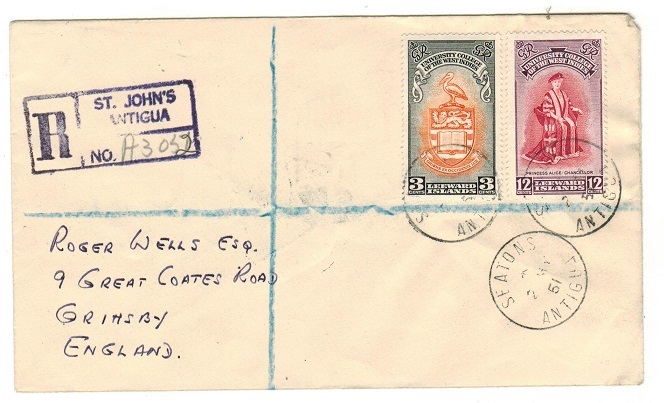 ANTIGUA - 1951 'University' pair on registered cover to UK used at JOHNSTONS POINT. 1951 (MY.17) reg'd cover to UK bearing 'University' pair tied by JOHNSTONS POINT/ANTIGUA cds with blue on white R/ANTIGUA/(JOHNSONS POINT)/No. reg'd label. ANTIGUA - 1951 'Leeward Is' University pair on registered cover to UK used at SEATONS. 1951 (MY.2.) 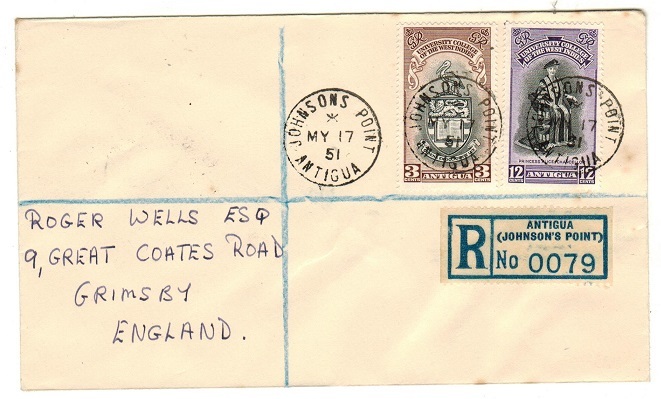 registered 'Wells' cover addressed to UK bearing 1951 University pair tied by SEATONS/ANTIGUA cds. 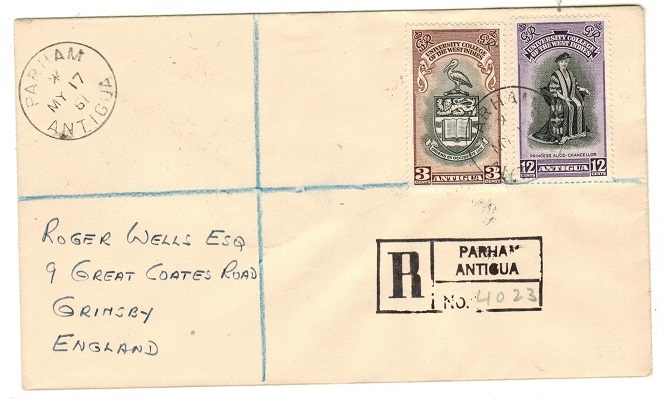 ANTIGUA - 1951 'Leeward Is' University pair on registered cover to UK used at PARHAM. 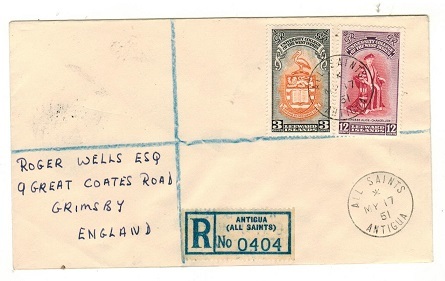 ANTIGUA - 1951 'Leeward Is' University pair on registered cover to UK used at BOLANS. 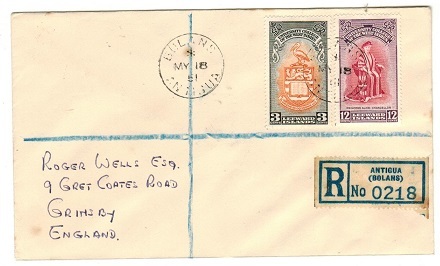 1951 (JU.1) registered 'Wells' cover addressed to UK bearing 1951 University pair tied by FREETOWN/ANTIGUA cds. 1951 (MY.18) reg'd cover to UK bearing Leeward Islands 'University' pair (SG 123-24) tied by BOLANS/ANTIGUA cds with blue on white R/ANTIGUA/(BOLANS)/No. label at bottom right. 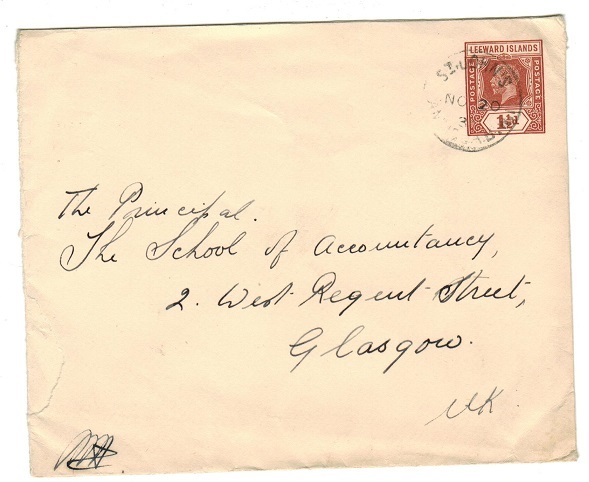 ANTIGUA - 1951 'Leeward Is' University pair on registered cover to UK used at ALL SAINTS. 1951 (MY.17.) 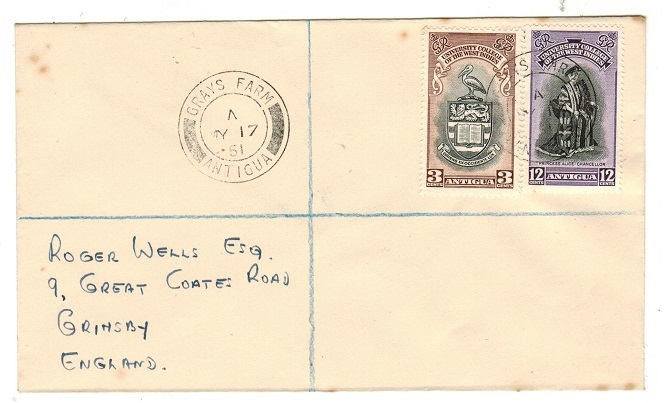 registered 'Wells' cover addressed to UK bearing 1951 University pair tied by ALL SAINTS/ANTIGUA cds. ANTIGUA - 1941 3d rate censor cover to USA. 1941 (AU.9.) 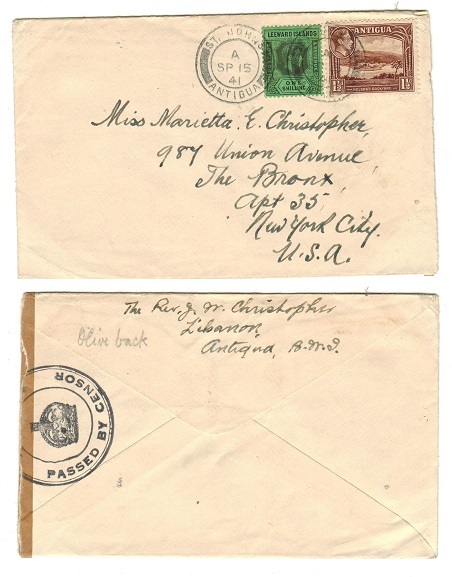 cover addressed to USA bearing Leeward Island 3d adhesive tied by ST.JOHNS/ANTIGUA cds with manila censor strip at left tied on reverse side by circular crowned ANTIGUA/PASSED BY CENSOR h/s with '2' inserted in blue manuscript. Miller type S1. 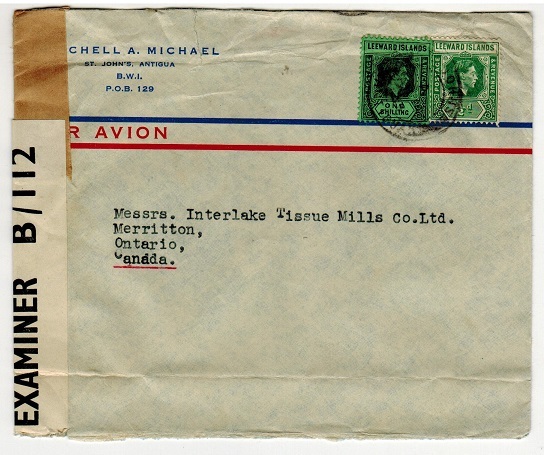 ANTIGUA - 1940 1/- rate censor cover to Canada. ANTIGUA - 1941 2 1/2d rate censor cover to USA. 1941 (JY.1.) underpaid cover addressed to USA bearing Leeward Islands 2 1/2d adhesive tied ST.JOHNS/ANTIGUA with 'T' tax mark at lower left and struck on the reverse side by crowned circular ANTIGUA/PASSED BY CENSOR h/s. (Miller type S1). ANTIGUA - 1945 2 1/2d rate 'IB/468' censor cover to St.Kitts. 1945 (MY.4.) 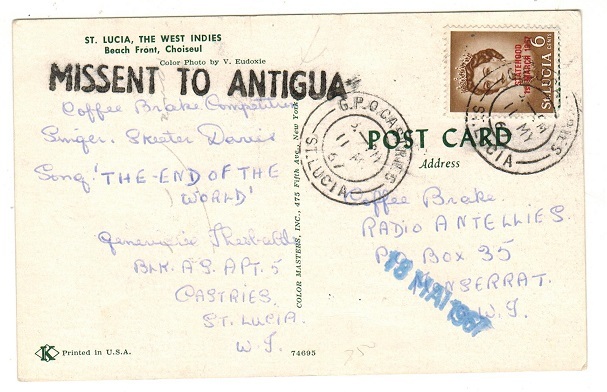 cover addressed to St.Kitts bearing Leeward Islands 2 1/2d adhesive tied by ST.JOHNS/ ANTIGUA cds with black on white P.C.90/OPENED BY EXAMINER/ IB/468 censor label. Inter-Island use. Miller type L8. Unrecorded with this number. 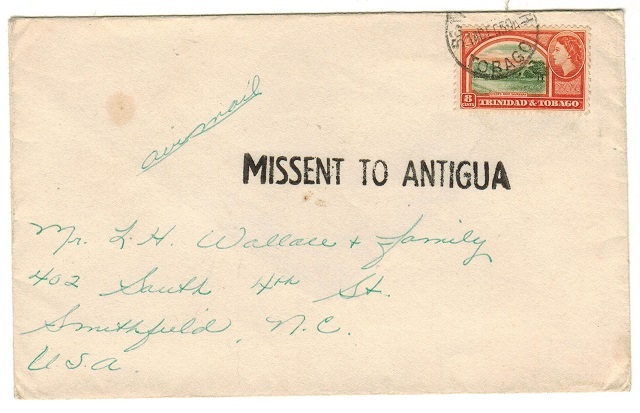 ANTIGUA - 1927 OHMS envelope to USA cancelled OFFICIAL PAID/ANTIGUA. 1927 (JY.22.) stampless OHMS cover addressed to USA cancelled by OFFICIAL PAID/ANTIGUA cds with black oval crowned POST OFFICE/ANTIGUA h/s at lower left. ANTIGUA - 1909 'Perkins Bacon' reprinted PROOF on the 'C.Jeens' head in black. 1909 'Perkins Bacon' reprinted PROOF of the 'C. Jeens' head (SG type 1) in black on thin cream card. 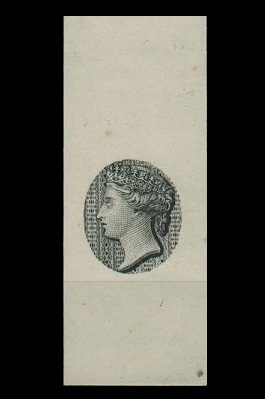 (20x53mm). 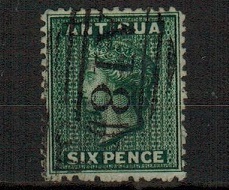 ANTIGUA - 1872 6d blue green with REVERSED WATERMARK cancelled 'A 18' at ENGLISH HARBOUR. SG 15x. 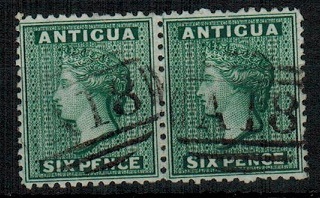 1872 6d blue green (perf 12 1/2 issue) showing the variety WATERMARK REVERSED and cancelled by scarcer 'A 18' duplex used at ENGLISH HARBOUR. SG 15x. ANTIGUA - 1940 1/- + 1/2d rate 'EXAMINED BY CENSOR' cover to USA. 1942 (FE.16.) 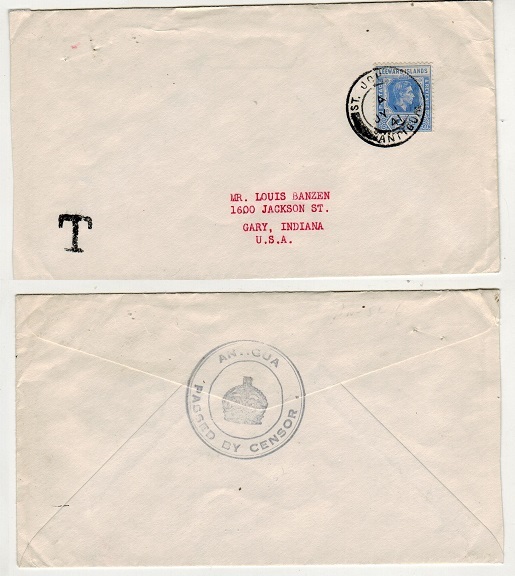 cover addressed to Canada (opened on two sides) bearing 1/2d and 1/- adhesives tied ST.JOHNS/ANTIGUA with manila censor strip at right tied on the reverse by EXAMINED BY CENSOR h/s in black with '2' inserted in blue crayon. 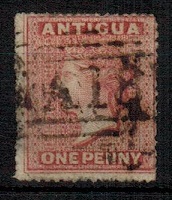 ANTIGUA - 1903 2d ultramarine RPSE unused. H&G 1. 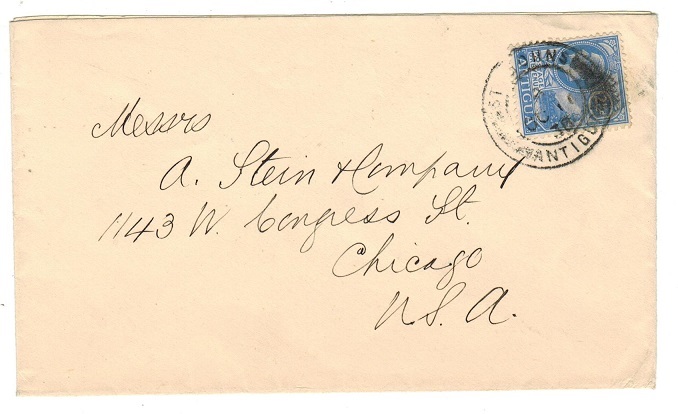 1903 2d ultramarine on cream registered postal stationery envelope (size G) in fine unused condition. H&G 1. ANTIGUA - 1922 £1 purple and red on red mint handstamped SPECIMEN. SG 61. 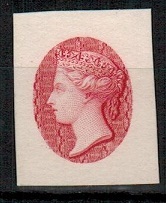 1922 £1 purple and red on red adhesive in fine fresh mint condition handstamped SPECIMEN. SG 61. ANTIGUA - 1924 3d ultramarine RPSE (size H2) unused. H&G 3a. 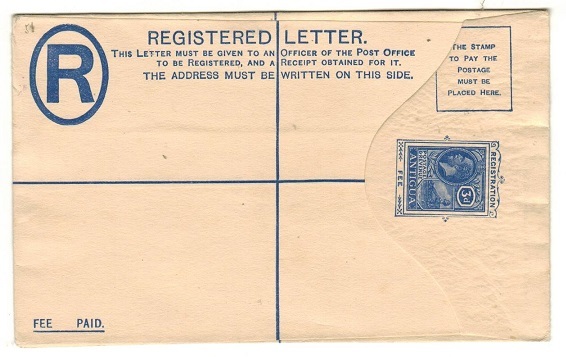 1924 3d ultramarine on cream registered postal stationery envelope (size H2) in fine unused condition. H&G 3a. ANTIGUA - 1944 4d rate 'OPENED BY EXAMINER/ B/112' censor cover to USA. 1944 (AU. ) 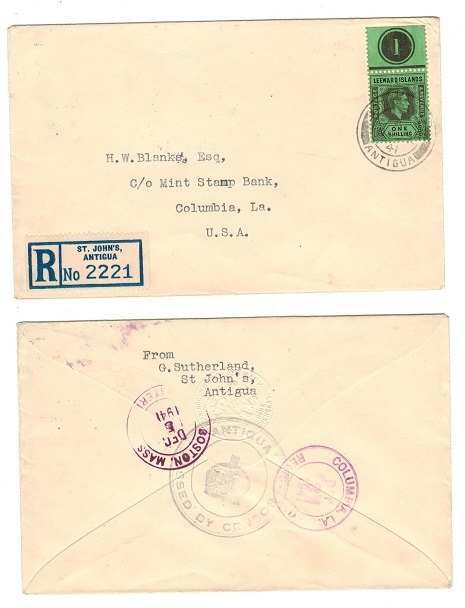 long commercial cover addressed to USA bearing 1d and 3d block of four tied by ST.JOHNS/ANTIGUA cds's with black on cream P.C.90/OPENED BY/EXAMINER B/112 censor label at left. Little type L5. ANTIGUA - 1930 1 1/2d rate postcard use to Austria used at ST.JOHNS. 1930 (OC.2.) use of picture postcard addressed to Austria depicting "H.M.S.Patrol Fleet at anchor off Rat Island during Riots" and bearing 1 1/2d adhesive tied to the picture side by s/r ST.JOHNS/ANTIGUA cds. A nice card. 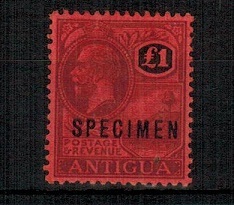 ANTIGUA - 1903 1d red PSE to UK used at ST.JOHNS. H&G 1. 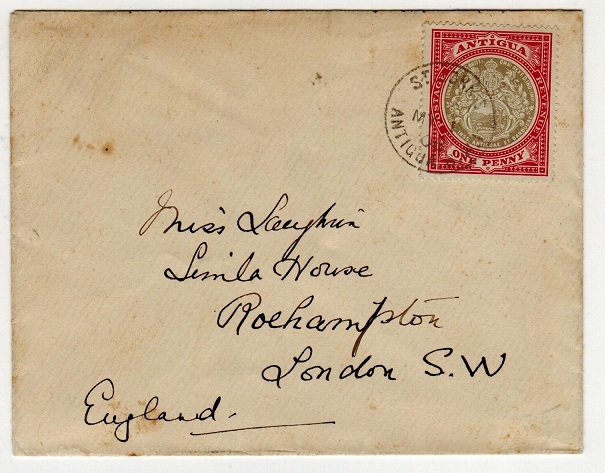 1903 1d red on white postal stationery envelope addressed to UK cancelled by s/r ST.JOHNS/ANTIGUA cds dated JY.12.05. H&G 1. 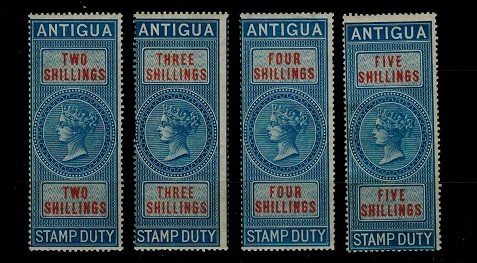 ANTIGUA - 1870 2d blue STAMP DUTY issue in a unmounted mint block of four. 1870 2d blue and dark blue STAMP DUTY issue in a fine unmounted mint bottom marginal block of four. Barefoot and Hall 2. ANTIGUA - 1944 censored cover to USA. 1944 (MR.6.) cover addressed to USA bearing 1d adhesive tied in combination with Leeward Island 1/- 'key plate' tied by light ST.JOHNS/ANTIGUA cds and with black on cream P.C.90/OPENED BY/EXAMINER B/112 censor label at left. Little type L5. ANTIGUA - 1941 censored cover to USA. 1941 (SP.15.) 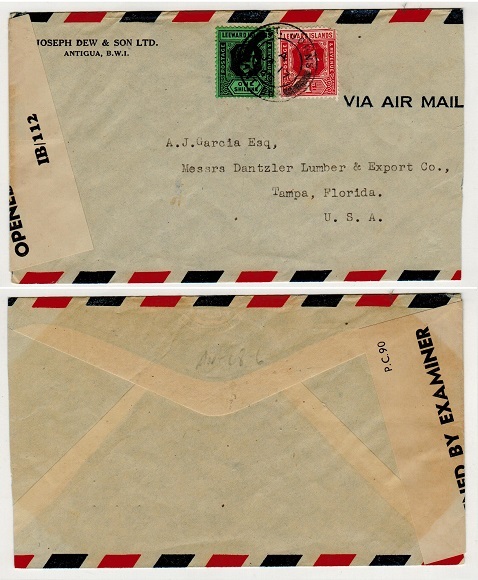 cover addressed to USA bearing 1 1/2d adhesive tied in combination with Leeward island 1/- 'key plate' issue by ST.JOHNS/ANTIGUA cds and with black crowned ANTIGUA/PASSED BY CENSOR h/s on reverse side. Little type S1. 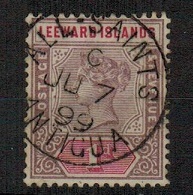 ANTIGUA - 1899 1d 'Leeward Islands' adhesive (SG 2) cancelled ALL SAINTS/ANTIGUA. 1899 1d 'Leeward Islands' key plate adhesive (SG 2) cancelled by superb central ALL SAINTS/ANTIGUA cds. ANTIGUA - 1943 censor cover to USA. 1943 (JY.17.) 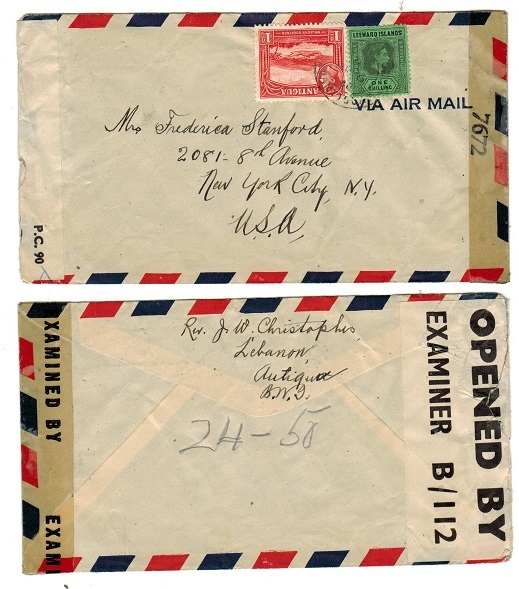 cover addressed to USA bearing 1 1/2d and 1/- adhesives tied ST.JOHNS/ANTIGUA with black on white P.C.90/OPENED BY EXAMINER/ - - censor label at right (Little type L10) with 'IB/493' inserted in manuscript. ANTIGUA - 1942 registered censored cover to Canada. 1942 (MY.2.) 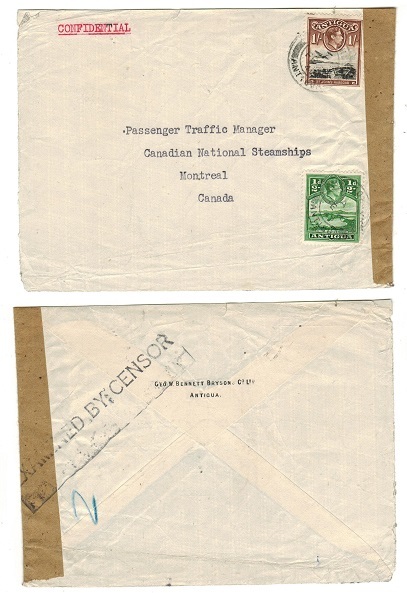 registered cover addressed to Canada bearing Leeward Islands 1d, 2 1/2d and 6d pair 'key plates' tied by ST.JOHN'S/ANTIGUA cds with black on white P.C.90/OPENED BY EXAMINER/ B/112 censor label at left. Miller type L3. ANTIGUA - 1941 2d rate censored postcard use to USA used at ST.JOHNS. 1941 use of picture postcard addressed to USA depicting 'Roseau Dominica Washers' bearing 1/2d amd 1 1/2d adhesives tied ST.JOHNS/ANTIGUA and struck by light ANTIGUA/PASSED BY CENSOR circular h/s in black ink. Miller type S1. ANTIGUA - 1943 censor cover to Canada. 1943 (AU.9.) 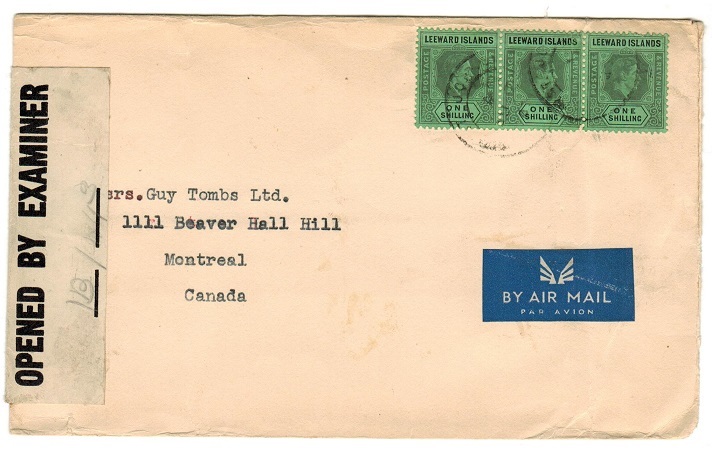 cover addressed to Canada bearing Leeward islands 1/- 'key plate' strip of three tied by weak ST.JOHNS/ANTIGUA cds and with black on white PC90/OPENED BY EXAMINER/ - - censor label at left (Miller type L10) with 'IB/493' inserted in manuscript. ANTIGUA - 1916 1/2d 'War Stamp' strip of three on cover to UK. 1916 (JA.2.) 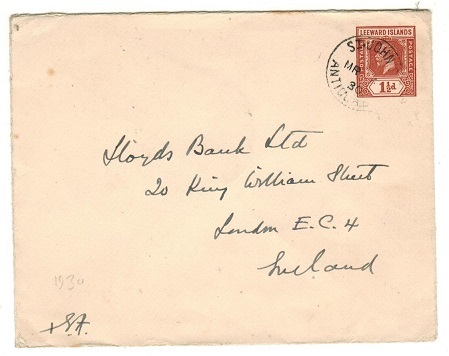 cover addressed to UK bearing a fine strip of three of the 1/2d green 'War Stamp' adhesive with red overprint (SG 53) opened on two sides and cancelled ST.JOHNS/ANTIGUA. ANTIGUA - 1905 1d 'arms' pair on cover to UK used at ST.JOHN'S/ANTIGUA. 1905 (AP.25.) 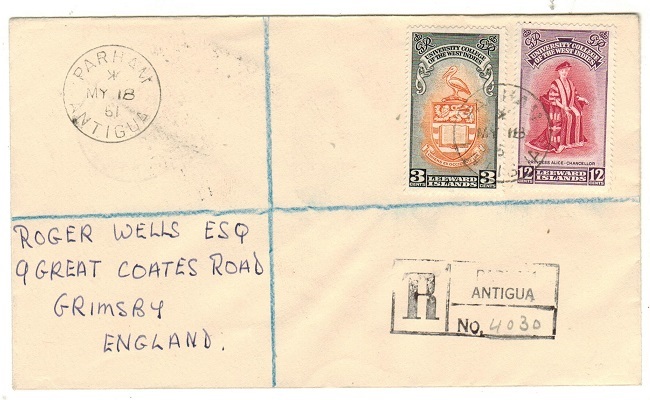 cover addressed to UK bearing 1d (SG 32) pair printed on the previous listed 'blue paper' and tied ST.JOHN'S/ANTIGUA. 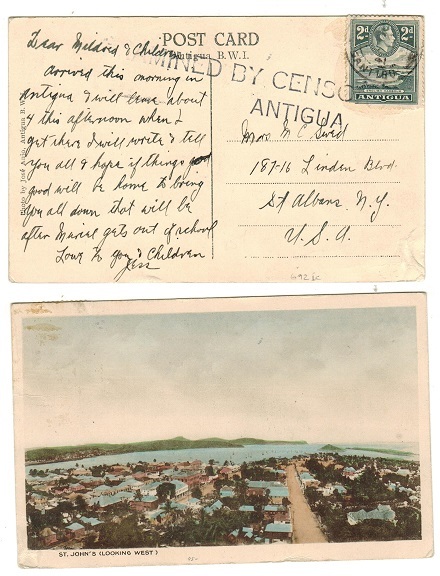 ANTIGUA - 1910 1/2d rate postcard use to USA used at ST.JOHN'S. 1910 (SP.2.) 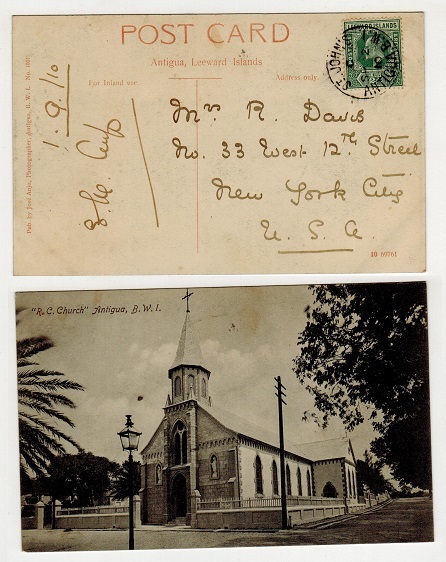 postcard addressed to USA depicting 'R.C.Church-Antigua' bearing Leeward Islands 1/2d green adhesive tied by ST.JOHNS/ANTIGUA cds. ANTIGUA - 1908 1d rate cover to UK used at ST.JOHN'S. 1908 (MY.1.) 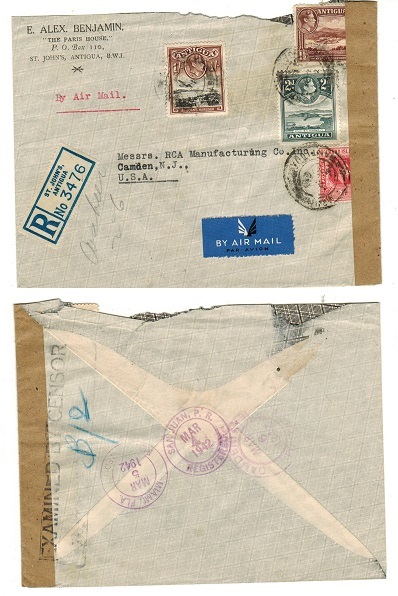 cover addressed to UK bearing 1d 'arms' adhesive tied by ST.JOHN'S/ANTIGUA cds. A fine new 'Empire' 1d rate cover. ANTIGUA - 1929 first flight cover to St.Thomas. 1929 (SP.26.) 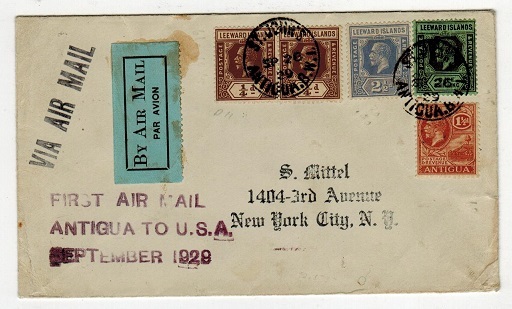 first flight cover addressed to USA (some gum staining from the adhesion of the BY AIR MAIl label). Bears 3d and 6d ahesives tied by ST.JOHNS/ANTIGUA BWI cds. ANTIGUA - 1943 1/- + 1/2d rate censored cover to Canada from St. Johns. 1943 (AUG.12.) 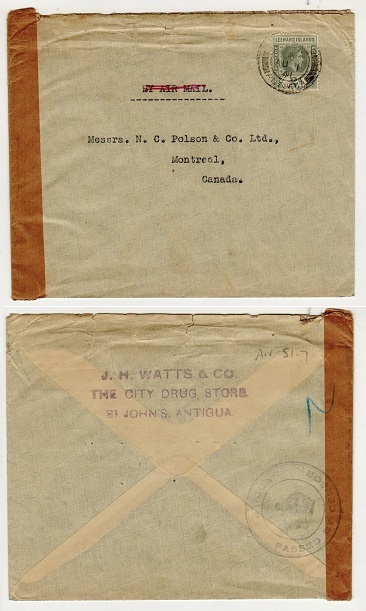 commercial cover addressed to Canada (fold along bottom edge) bearing Leeward Islands 1/2d and 1/- 'key plate' issues tied ST.JOHNS/ANTIGUA and with black on white P.C.90/ OPENED BY/EXAMINER B/112 censor label at left edge. 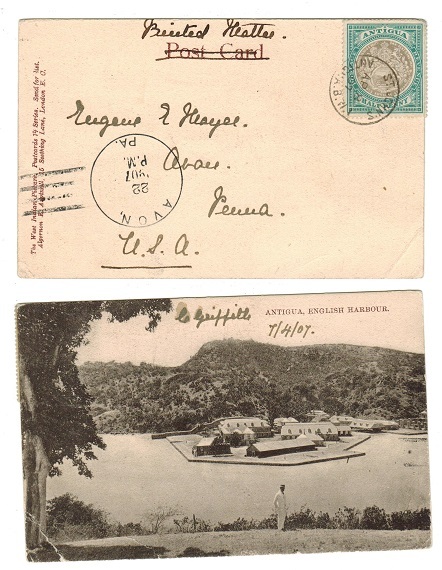 ANTIGUA - 1914 R.M.S.P. Canadian tour publicity label mint. 1914 R.M.S.P. Canadian tour label for Antigua on perforated gummed paper. Highly coloured and attractive. 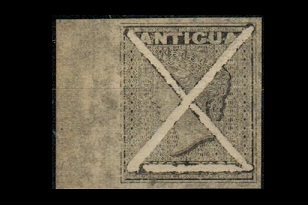 ANTIGUA - 1864 1d dull rose cancelled 'A 18' at ENGLISH HARBOUR. SG 6. 1864 1d dull rose (rough perf) adhesive cancelled by 'A 18' duplex of ENGLISH HARBOUR. SG 6. ANTIGUA - 1970 25c crimson COIL LEADER and trailer. SG 259a. 1970 25c crimson 'Coil' adhesive on upright watermarked chalk surfaced paper in a fine mint COIL LEADER pair with REQn 8/45223/1 official label attached together with a further trailer pair from the end of the roll. Difficult item. SG 259a. ANTIGUA - 1970 10c emerald COIL LEADER and trailer. SG 258a. 1970 10c emerald 'Coil' adhesive on upright watermarked chalk surfaced paper in a fine mint COIL LEADER pair with REQn 8/45223/1 official label attached together with a further trailer pair from the end of the roll. Difficult item. SG 258a. ANTIGUA - 1970 5c blue COIL LEADER and trailer. SG 257a. 1970 5c blue 'Coil' adhesive on upright watermarked chalk surfaced paper in a fine mint COIL LEADER pair with REQn 8/45223/1 official label attached together with a further trailer pair from the end of the roll. Difficult item. SG 257a. ANTIGUA - 1935 1/- 'Silver Jubilee' mint with VIGNETTE 4 in bottom margin. SG 94. 1935 1/- slate and purple 'Silver Jubilee' adhesive (SG 94) in a fine mint example with vignette plate 4 in bottom margin. ANTIGUA - 1867 1d vermilion struck by 'A 18' duplex of ENGLISH HARBOUR. SG 7. 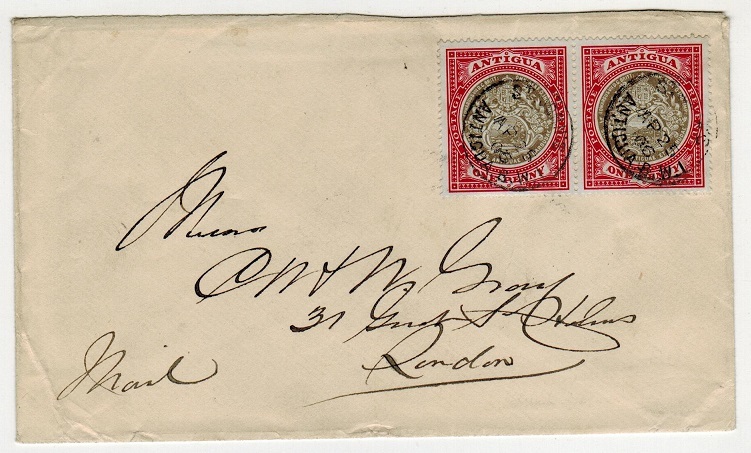 1867 1d vermilion (rough perf 14 to 16) issue cancelled by scarce 'A 18' duplex used at English Harbour. SG 7. ANTIGUA - 1913 2 1/2d rate use of picture postcard to Belgium. 1913 (MR.26.) 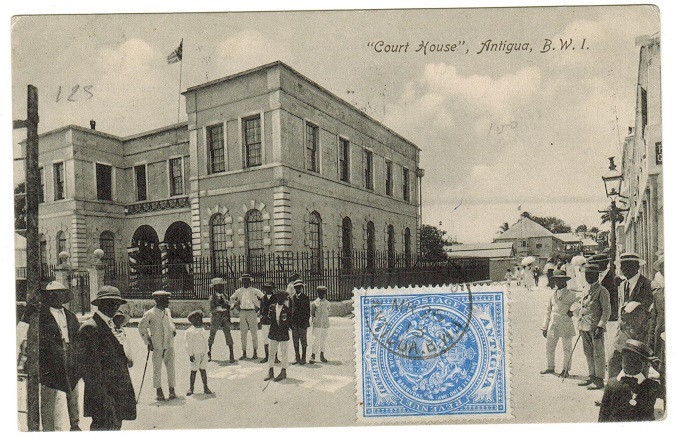 use of picture postcard addressed to belgium depicting 'Court House-Antigua' bearing 2 1/2d 'arms' adhesives tied to picture side by ST.JOHNS/ANTIGUA cds. ANTIGUA - 1872 6d pair cancelled 'A 18' at ENGLISH HARBOUR. SG 15. 1872 6d blue-green perf 12 1/2 'CC' watermark horizontal pair each cancelled by 'A 18' duplex's used at ENGLISH HARBOUR. SG 15. ANTIGUA - 1930 2 1/2d rate cover to USA used at ST.JOHN'S/ANTIGUA. 1930 (JU.11.) 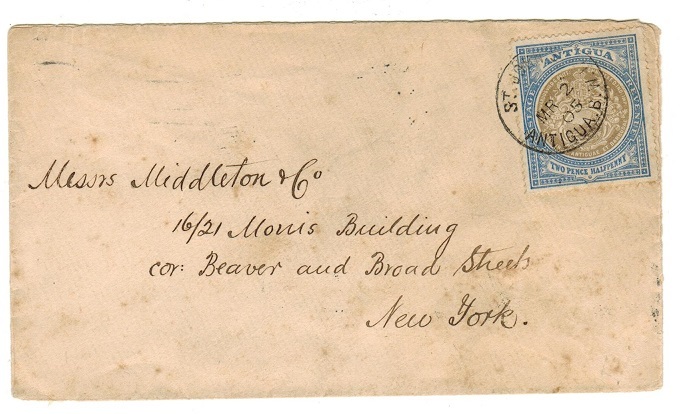 cover addressed to USA bearing 2 1/2d bright blue (SG 71-scarce) tied by ST.JOHNS/ ANTIGUA cds. 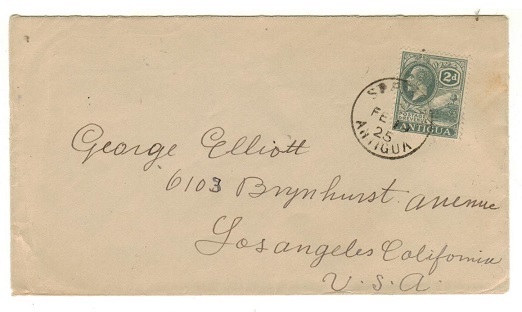 ANTIGUA - 1920 registered cover to USA with late WAR TAX adhesive use. 1920 (FE.20.) 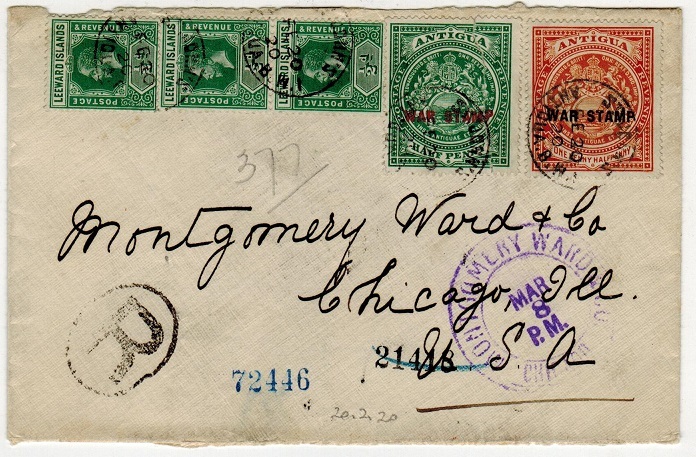 registered cover addressed to USA (opened on two sides-ex reverse flap) bearing 1/2d and 1 1/2d 'War Tax' adhesives (SG 53+54) tied in combination with Leeward Islands 1/2d strip of three by ST.JOHN'S/ANTIGUA. BWI cds's. ANTIGUA - 1928 multi franked registered cover to USA. 1928 (JY.31.) 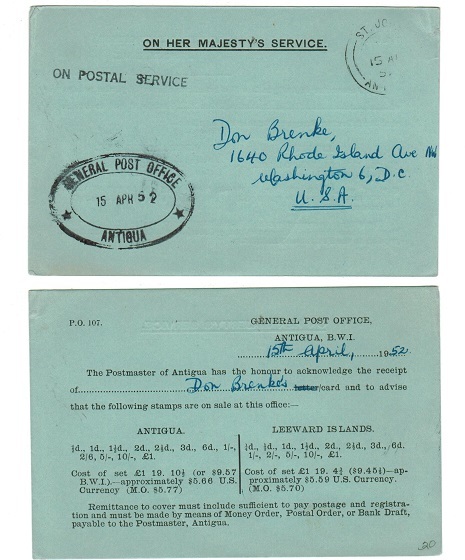 registered cover addressed to USA bearing 1/2d block of four plus 1d and 1 1/2d adhesives tied by ST.JOHNS/ANTIGUA cds with blue on white R/ANTIGUA/(ST.JOHNS)/NO. label at left. ANTIGUA - 1931 use of Leeward Islands 1 1/2d PSE to UK used at ST.JOHNS/ANTIGUA. 1931 (NO.20.) 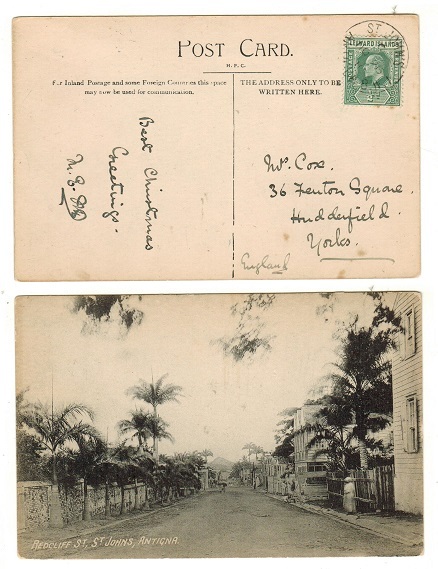 use of the Leeward Islands 1 1/2d brown on cream postal stationery envelope (opened on two sides) addressed to UK cancelled by ST.JOHNS/ANTIGUA cds. H&G 8. 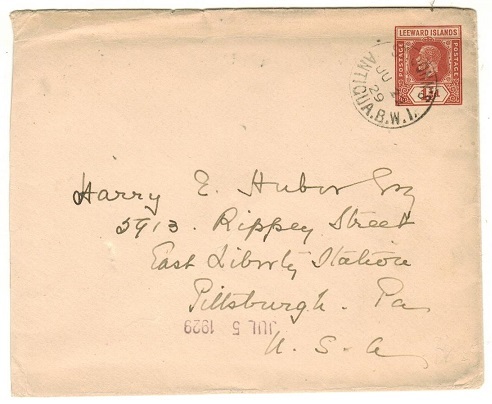 ANTIGUA - 1917 OHMS-RETURNED LETTER OFFICE/ANTIGUA envelope to USA. 1917 (JA.8.) 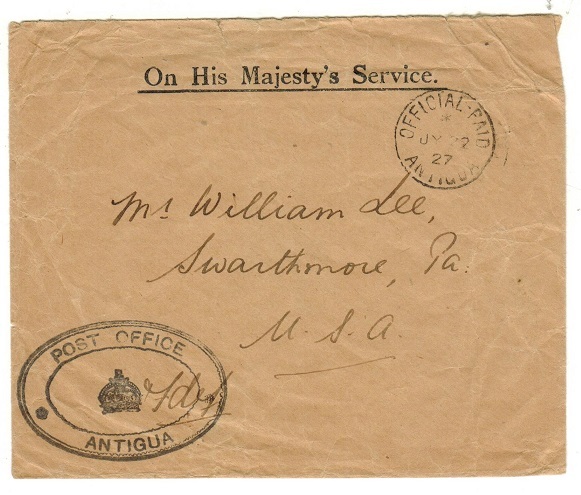 use of black on manilla ON HIS MAJESTYS SERVICE/RETURNED LETTER OFFICE/ ANTIGUA envelope (165x102mm) bearing Leeward 1d adhesive tied ST.JOHNS/ANTIGUA BWI cds. 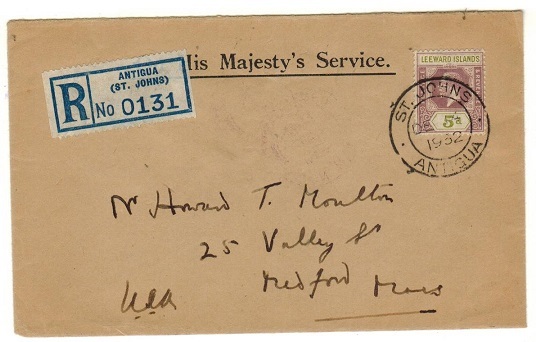 ANTIGUA - 1933 2d rate 'Last Day of Issue' Tercentenary cover. 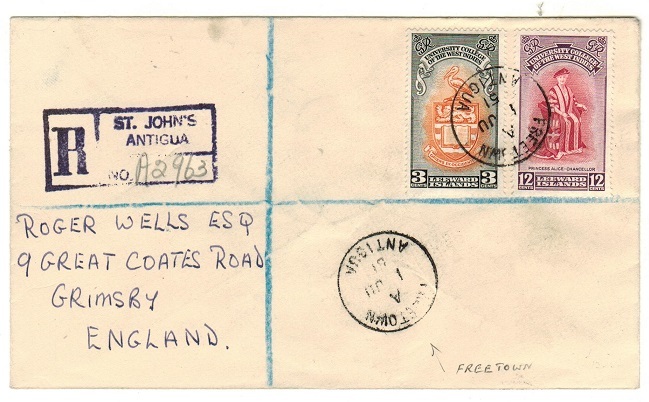 1933 (JA.26) cover addressed locally bearing 2d (SG 84) tied ST.JOHNS/ANTIGUA with superb three lined LAST DAY OF/TERCENTENERY/ISSUE h/s at left. 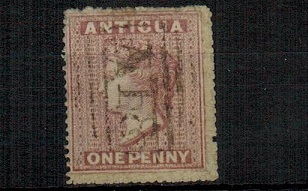 ANTIGUA - 1867 1d vermilion cancelled 'A 02'. SG 7. 1867 1d vermilion (small star watermark) adhesive struck by sharp 'A 02' duplex. SG 7. 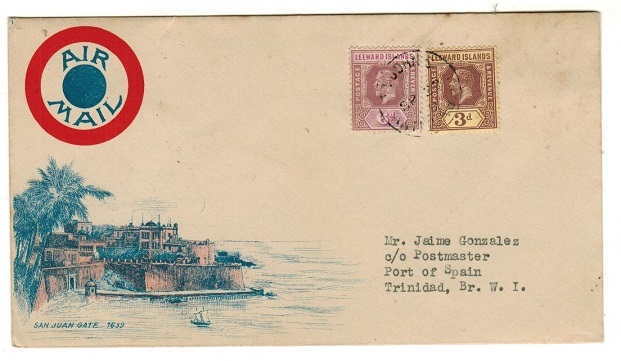 ANTIGUA - 1929 first flight cover to Porto Rico. 1929 (SP.26.) 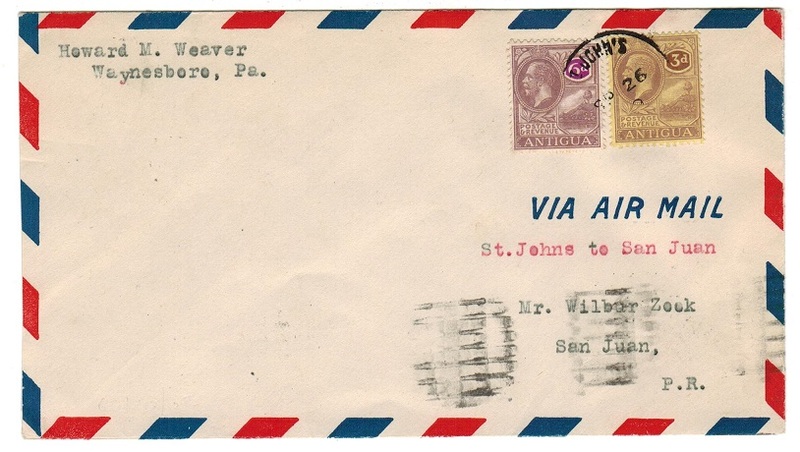 first flight cover to Porto Rico bearing 1/2d pair together with Leeward Islands 2d and 6d 'key plate' issues tied ST.JOHN'S/ANTIGUA with three lined FIRST AIR MAIL cachet applied in black. 632 covers were flown. ANTIGUA - 1909 'Perkins Bacon' reprinted PROOF of the 'C.Jeens' head in red. 1909 'Perkins Bacon' reprinted PROOF of the 'C. 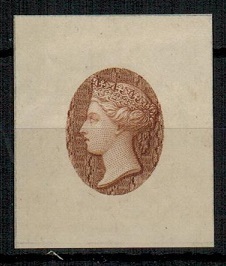 Jeens' head (SG type 1) in red on thin cream card. (20x25mm). ANTIGUA - 1909 'Perkins Bacon' reprinted PROOF of the 'C.Jeens' head in brown. 1909 'Perkins Bacon' reprinted PROOF of the 'C. Jeens' head (SG type 1) in brown on thin cream card. (28x33mm). ANTIGUA - 1929 first flight cover to San Juan. 1929 (SP.26.) first flight cover to San Juan bearing 3d and 6d adhesives tied by part ST.JOHNS/ ANTIGUA cds with SAN JUAN arrival b/s. 632 covers were flown. ANTIGUA - 1929 inward first flight cover from San Juan. 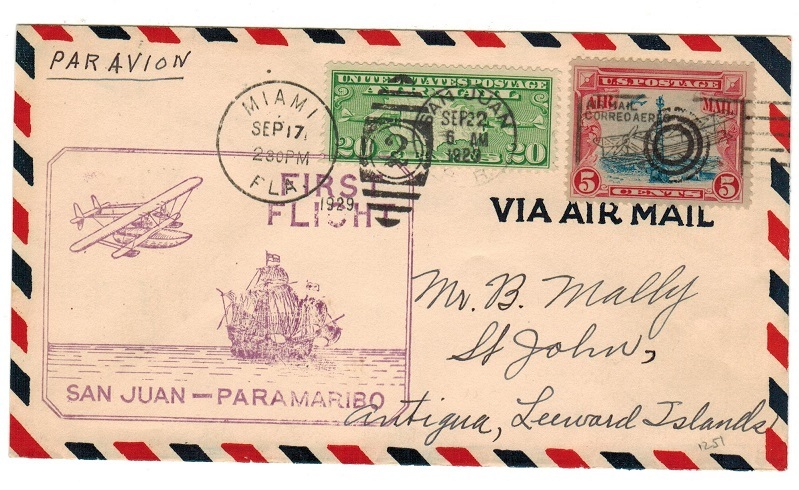 1929 inward first flight cover addressed to St.John's from San Juan with magenta SAN JUAN- PARAMARIBO cachet at left and ST.JOHN'S/ANTIGUA arrival b/s. ANTIGUA - 1941 Leeward Islands 1/- 'PLATE 1' on censored cover to USA used at ST.JOHNS. 1941 (NO.27.) 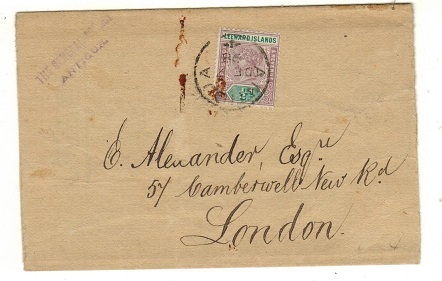 registered cover addressed to USA bearing Leeward Island 'KGVI' 1/- adhesive in a fine top PLATE 1 example cancelled by ST.JOHNS/ANTIGUA cds with large black crowned ringed ANTIGUA/PASSED BY CENSOR h/s applied to reverse. 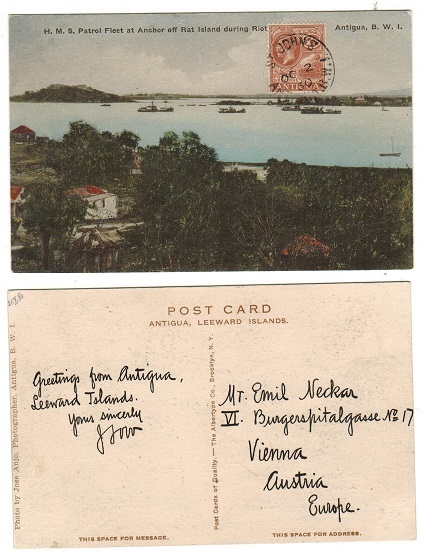 ANTIGUA - 1910 1/2d rate use of postcard to USA used at ST.JOHNS/ANTIGUA. 1910 (SP.2.) 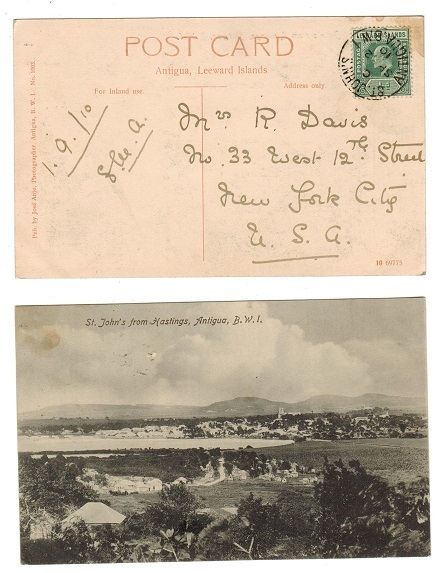 use of picture postcard addressed to USA depicting 'St.Johns from Hastings, Antigua' and bearing Leeward Island Edw VII 1/2d green adhesive tied by ST.JOHNS/ANTIGUA B.W.I. cds. ANTIGUA - 1907 1/2d rate postcard to USA used at ST.JOHNS/ANTIGUA. 1907 (AP.8.) 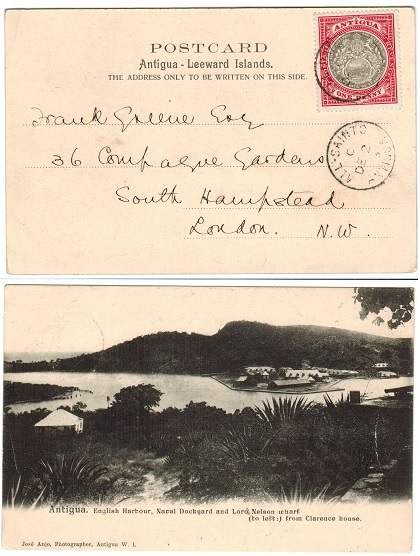 use of picture postcard addressed to USA depicting 'Antigua, English Harbour' and bearing 1/2d 'arms' adhesive tied by ST.JOHN'S/ANTIGUA cds. 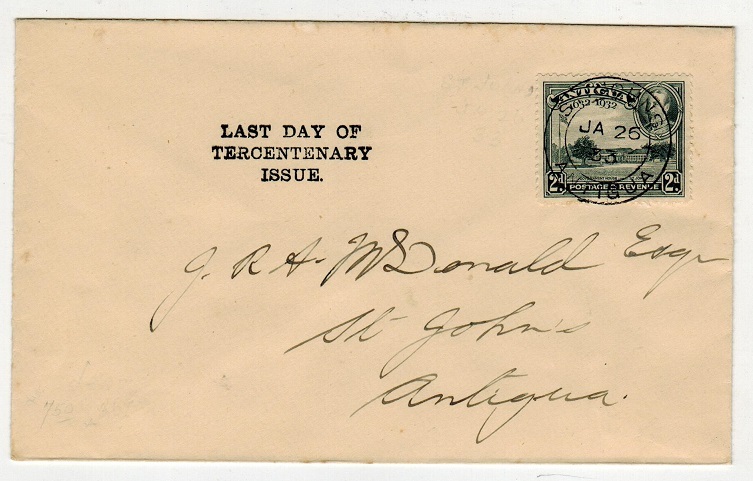 ANTIGUA - 1905 2 1/2d rate cover to USA used at ST.JOHNS. 1905 (MR.2.) 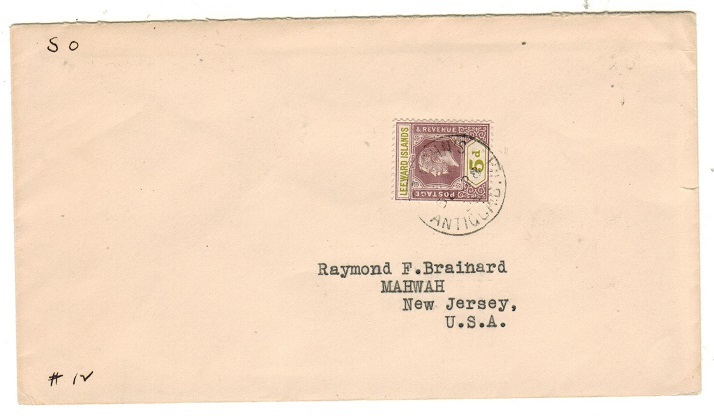 cover addressed to USA (some light tone marks) bearing the 2 1/2d adhesive (SG 34) tied by ST.JOHNS/ANTIGUA cds. NEW YORK arrival b/s. ANTIGUA - 1929 first flight cover to USA from ST.JOHN's by Pan American Airways. 1929 (SP.26.) 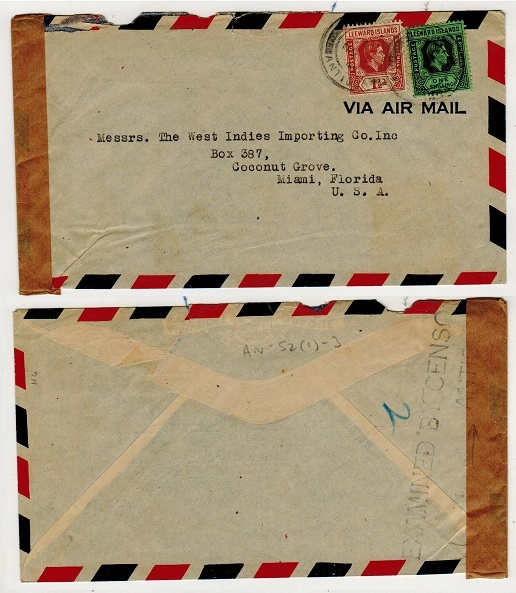 first flight cover addressed to USA bearing 1 1/2d adhesive tied in combination with Leeward Island 'key plate' 1/4d pair, 2 1/2d and 1/- adhesives by ST.JOHNS/ANTIGUA cds and with magenta three lined FIRST AIR MAIL/ANTIGUA TO USA/SEPTEMBER 1929 h/s applied. A Pan American Airways flight. 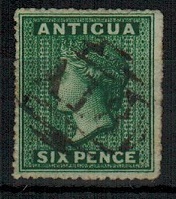 ANTIGUA - 1863 6d green struck by 'A 18' duplex of ENGLISH HARBOUR. SG 8. 1863-67 6d green on small star watermarked paper with rough perforation in fine condition cancelled by central 'A 18' duplex of ENGLISH HARBOUR. SG 8. 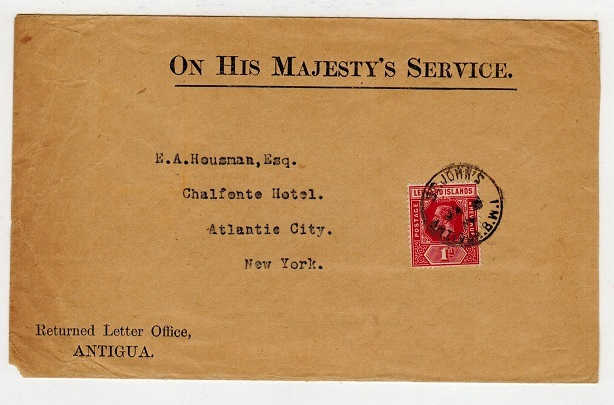 ANTIGUA - 1923 OHMS envelope to USA cancelled OFFICIAL PAID/ANTIGUA. 1923 (SP.24.) long stampless O.H.M.S. 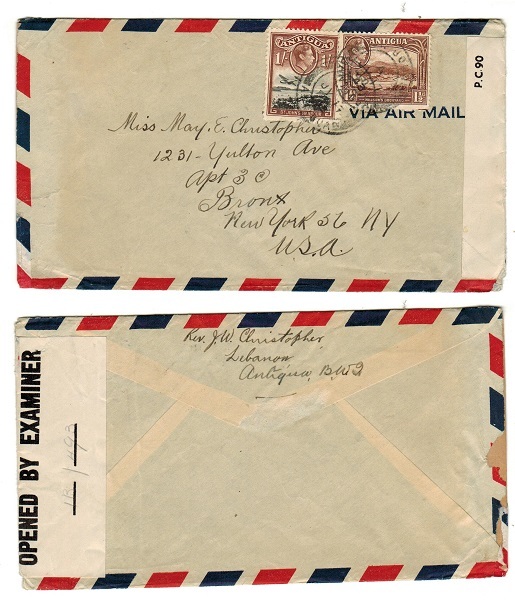 envelope addressed to USA cancelled by OFFICIAL PAID/ ANTIGUA cds with brownish red oval POST OFFICE/ANTIGUA crown strike at lower left. 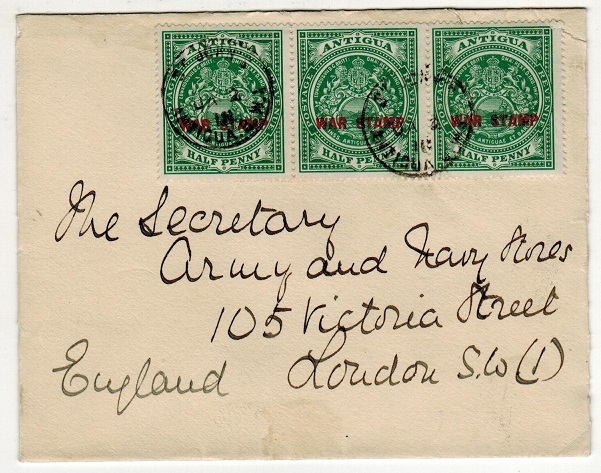 ANTIGUA - 1935 1 1/2d rate 'last day' cover use to Australia. 1935 (DE.30.) 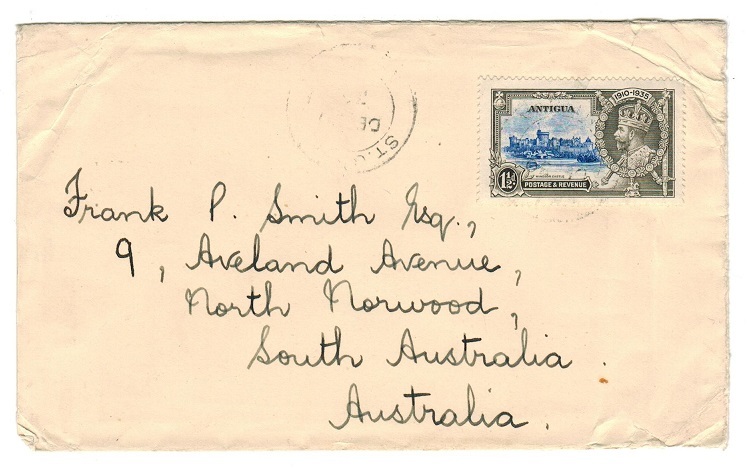 cover addressed to Australia bearing the 1 1/2d 'Silver Jubilee' adhesive (SG92) tied by light ST.JOHNS/ANTIGUA cds.